The Amish Port Royal Dining Table is perfect for casual or formal dining rooms. It features two pedestals and a hardwood stretcher for additional stability. Wheat Stretchers and Spindle Stretchers are also available for between the pedestals. 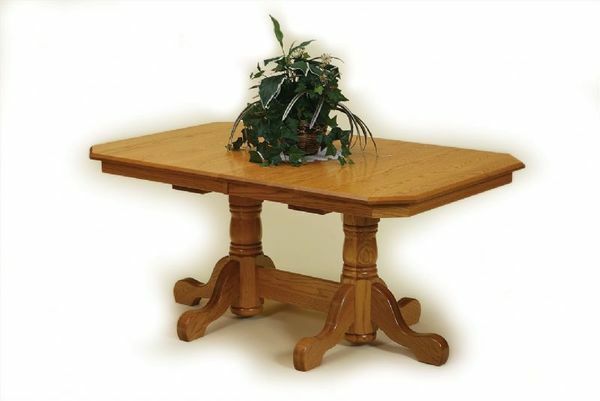 The Port Royal Double Pedestal Dining Table is crafted from solid hardwood by Amish woodworkers. Tables are inspected throughout the build-process to ensure there are no material or workmanship related defects. Each table is signed and dated by its craftsman. As an added bonus the Port Royal Table features double equalizer slides. This enables the table to extend with just one person pulling! Whereas normally a second person would have to hold the opposite end of the table. With any questions or to begin an order please call 1-866-272-6773 or visit us at our store in Florida.